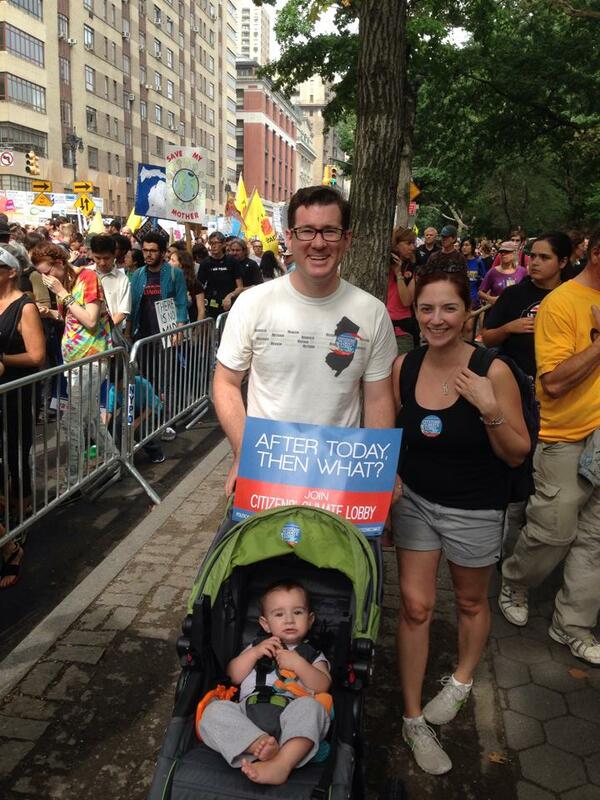 Yesterday we had the crazy awesome experience of marching in the People’s Climate March in New York City. You may have heard about it on the news since it was the biggest climate march ever and also the largest social demonstration of the past decade. It was set for two days before the UN Climate Summit where 125 world leaders would kick start a process to get a broad, significant climate agreement together. And when I say crazy, I mean crazy. The organizers were expecting 100,000 people and were hoping for 250,000. The latest numbers are at nearly 400,000 marchers attending. The mind can’t even process that number. While there were the celebrities like UN Secretary General Ban Ki Moon, Al Gore and Leo di Caprio, this march was about the regular people. A lot of regular people. 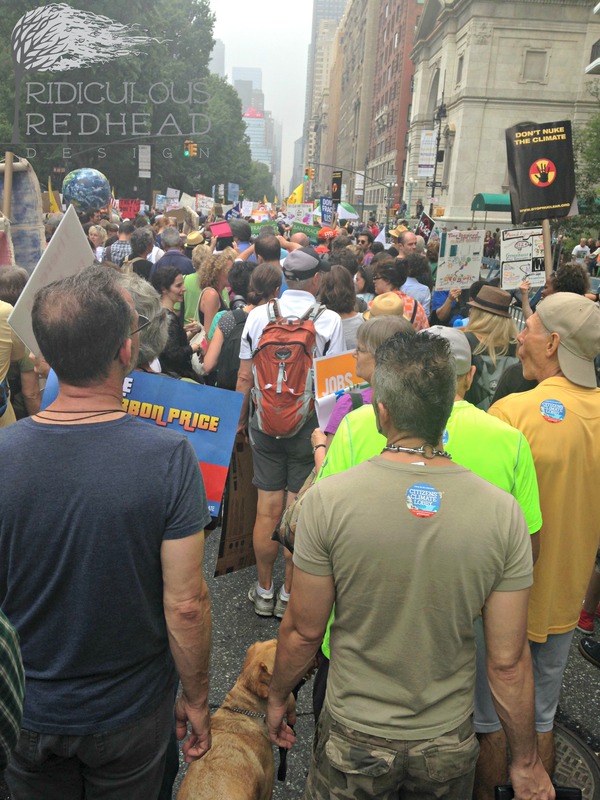 I was amazed at what a cross section of people were there, from bikers to 80 year old women with walkers, bankers to hippie vegans. 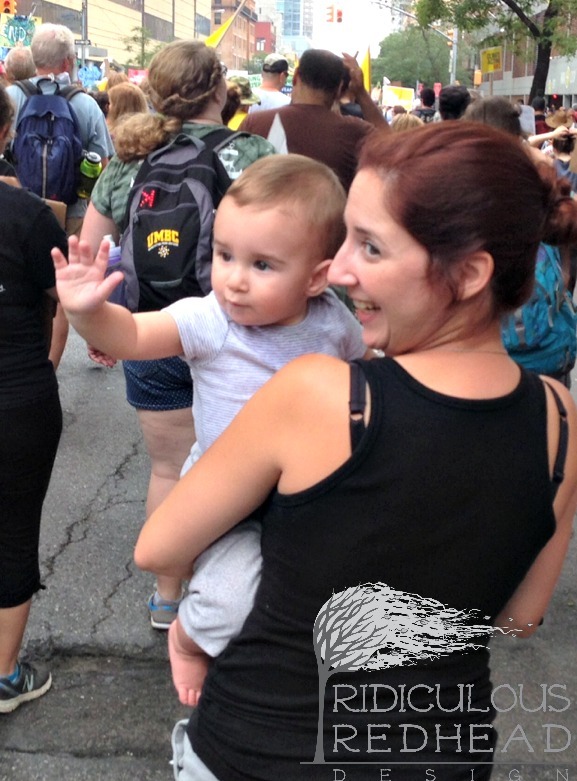 And families just like us who wanted to stand (or march) and be counted as giving a damn. The route started out at 65th St and Central Park West. 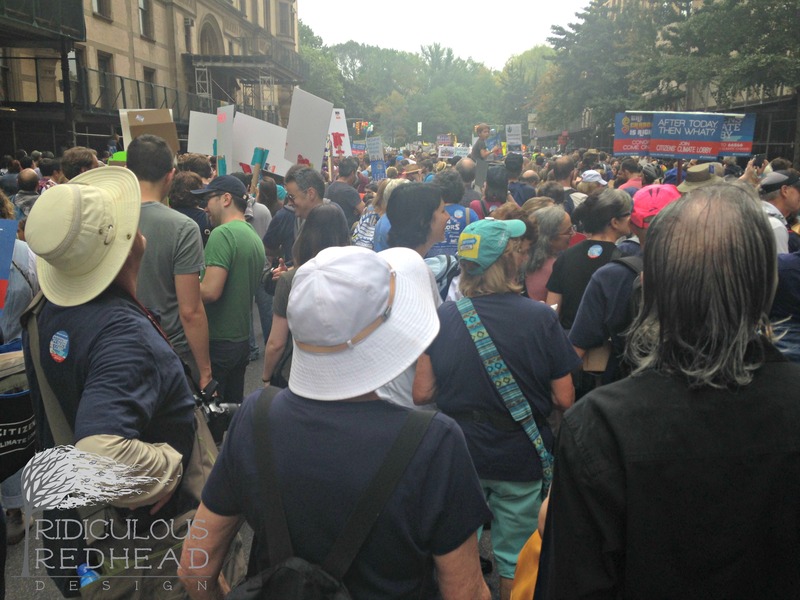 The area for everyone to line up was to stretch up to 86th St (2o blocks) but with so many people it backed up onto the side streets and up to 93rd St. We tried to go down 72nd St to get to where the environmental groups were supposed to line up and it was backed up with people. The building on the left (The Dakota where John Lennon was shot) is on the corner of 72nd (where we were) and the parade route. That means we aren’t even on the march route yet which is up ahead at the end of the building. We waited there for almost two hours before we even got to marching! 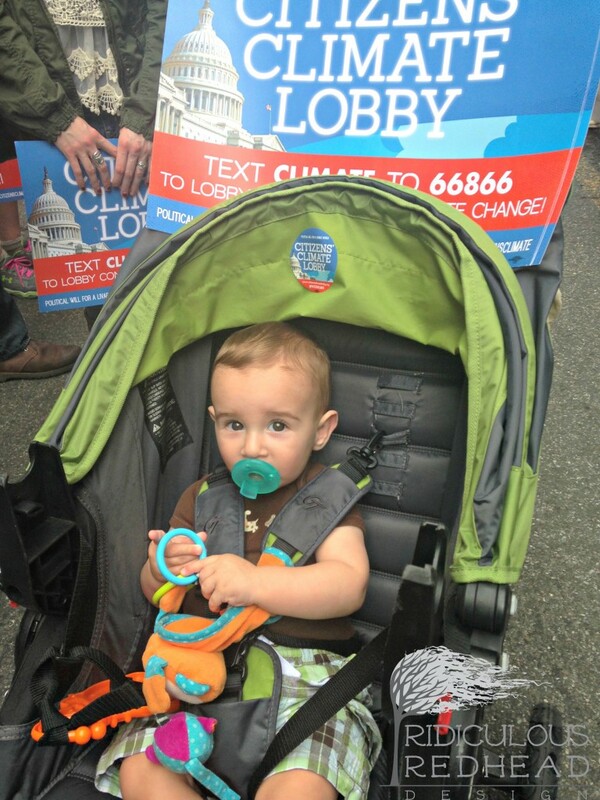 We marched with members of the Citizens Climate Lobby (TB is a member and they hosted the conference when we went to DC) who are working on a climate tax that pays a dividend back to taxpayers. Luckily they had signs and stickers since it didn’t occur to me to make anything until that morning. Standing around waiting to march can be pretty exhausting. 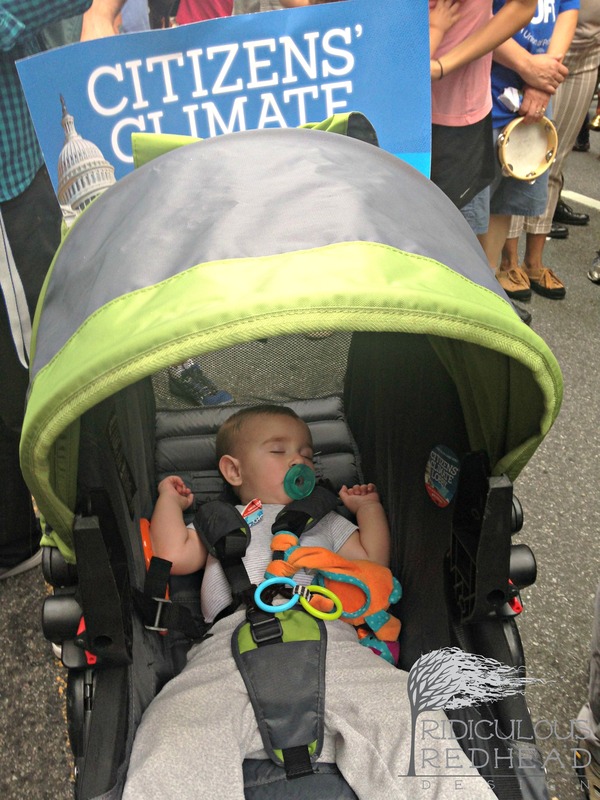 Lincoln took the opportunity for a nap in the middle of all the craziness. Once we merged into the march it took us another hour just to get to the start line. There were all kinds of signs and things people carried. 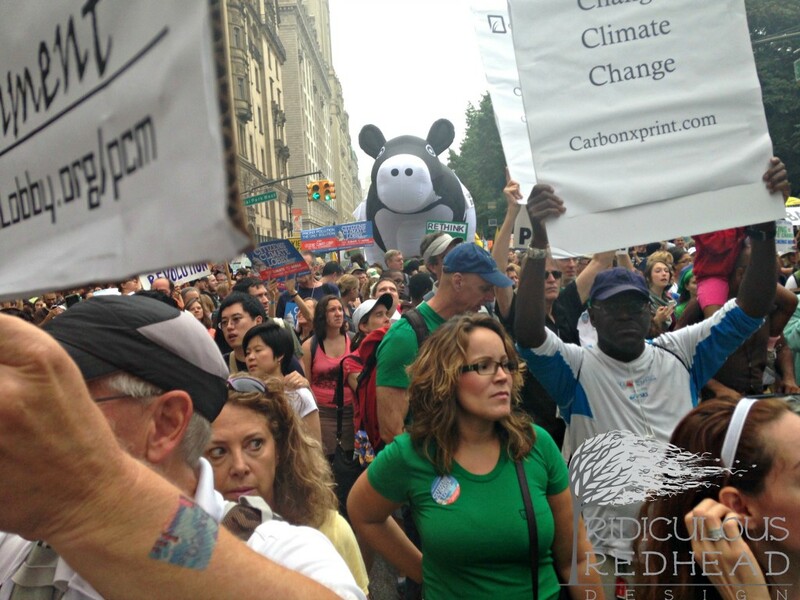 One of my favorites was a group of vegans marching to remind people how hard eating meat is on the environment by bringing a huge inflatable cow! TB and I have this running joke that I really want a cow in the backyard but he won’t let me. Throughout the march people would just start making noise and everyone would chime in at once. It was so energizing. So many times you want to yell about the things you care about and here we all were yelling together! We ended up right behind two men and their dogs a good amount of the way through. One man had a sweet yellow dog (below) and the other had two min pins in a rolling suitcase (you can see the handle). This view is Central Park South almost at the starting line with the park on the left. I found out later that as we were getting here, the beginning of the march was already finished. That means the entire 2.2 mile route was full of people with blocks of people still behind us! We parked by the end of the march route which meant we had to walk up to the start before we even go to the start. I am guessing we walked almost 100 blocks yesterday. As you can imagine we were exhausted. Our car was easy to get to but since so much of the city was closed, it was a nightmare getting out. I think it took almost two hours to go the six blocks to the Lincoln tunnel entrance. It was worth it. People came from nearly all 50 states and many foreign countries. There were 1574 different groups that participated plus all those regular people. I hope that everyone’s efforts will show that the masses really do care about climate change and protecting the earth. It was great to see so many diverse groups working together for what we believe in. I took the stickers off my shirt last night so I can save them for Lincoln. I think it will be pretty cool to show him how he was a part of it all when he is older.